► SOUTH SUDAN: Kenyan Fokker 50 crash lands in Aweil; no casualties. News wires are reporting the crash landing this afternoon, of a Kenyan Skyward International Fokker 50 (MSN: 20175 | 5Y-CAN) in Aweil, the capital of Northern Bhar al Ghazal state, South Sudan. The flight was carrying members of the International Office of Migration (IOM) returning from a conference in Khartoum, Sudan. ► SOUTH SUDAN: Kush Air to take delivery of an Antonov AN-12. 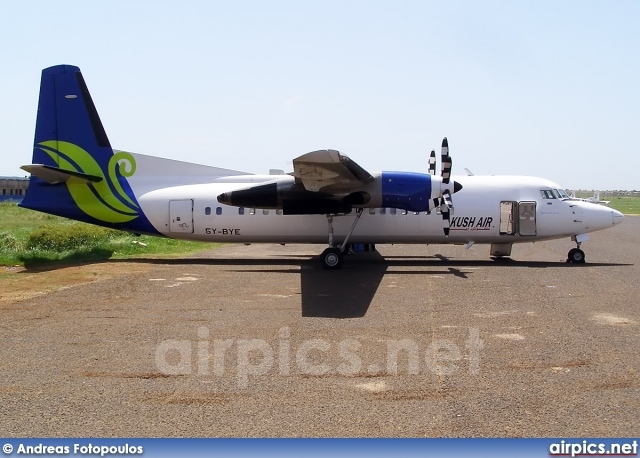 South Sudanese carrier and charter company Kush Air is set to receive an Antonov An-12 (MSN# 347007 | ST-KNR) joining its Let 410 and Fokker 50 (MSN# 20204 | 5Y-BYE) turboprop leased from Kenya’s Skyward Aviation International. The airline currently serves Wau, Bentiu, Aweil and Malakal from its base in Juba, with plans to offer flights to Rumbek, Yambio and Renk.